It starts off with a very sharp jabbing feeling or pain in a tooth on eating a hard food. The pain stops after a while. It may be sensitive to cold or hot, but eventually it stops. Everything is fine then every so often, after eating, the pain returns fleetingly. With time the frequency of the pain increases till one day a bit of a tooth breaks off and the pain stops. Now the cracked tooth is a broken tooth! When decay has gone from a white patch on the tooth surface, to a cavity, a weakening of the tooth structure occurs. This weakness is forever. A filling does not make the tooth stronger. It only replaces the lost tooth structure and keeps out bacteria and debris, i.e. the tooth is more easily cleaned. With a sufficiently strong filling material the tooth can then be bitten on. However the tooth is forever weakened. We are now keeping flawed teeth longer. Stresses do build up in the tooth over time. This depends on the heaviness of the bite on the tooth, the size and shape of the original cavity, and how the filling protects the tooth. A person who tends to grind their teeth is more likely to cause stress to build up in these teeth and cracks in the tooth structure can occur. The outer layer of the tooth is called the enamel and is a hard crystal material. The miracle of teeth is the next layer of the tooth, the dentine, which consists of mini tubes connecting to the nerve, and is the “spring” of the tooth. This allows the hard outer layer to bend and flex. If the dentine is lost under the enamel, then the enamel will become brittle and eventually will chip off. If dentine has a crack in it, then the tooth structure around it will come away and split. Generally the tooth breaks above the gum line. This situation is worsened with a tooth that has been root canal treated. In order to reach the nerve, an access through the tooth structure has to be made. If the tooth is not protected then if it cracks it tends to break to the level of the bone. This is because the bone acts like reinforcement on the hollowed out tooth. In some cases the tooth can split down the middle. 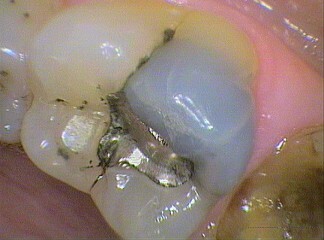 When this happens the tooth can not be saved and needs to be removed. Finding the cracked tooth can sometimes be elusive. This needs the Oral Sherlock Holmes skills to track it down. An x-ray generally does not show cracks unless they are very large. So we have to try and reproduce the pain. This is done by tapping on the tooth at different points and angles. This produces a bending force which hopefully opens the crack and produces a sharp pain or it may sound “hollow”. Cold tests on the tooth may cause a heightened response. Even if a crack can be seen on the tooth it is no guarantee that is where the problem is as a new crack may not be noticeable. Adjusting the bite on a sensitive area of the tooth may be enough to stop the symptoms. Unfortunately, to confirm a crack in the tooth, direct vision of it in the dentine may need to be done. 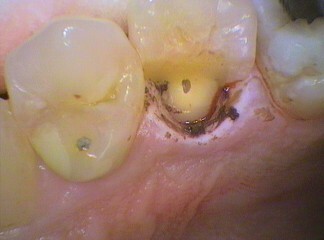 This is achieved by removing the filling in the offending tooth. But often the pain can be vague or referred to other teeth. “First do no harm“. If the dentist is uncertain then it is best left alone. 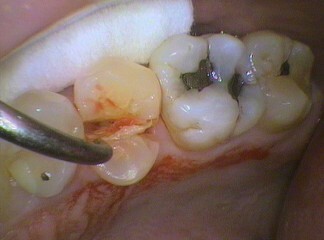 Often, with time, the discomfort can be localised more easily, or the ultimate diagnosis, part of the tooth breaks off!. In a future blog this month we will discuss treatment options in Cracked teeth – Help is on the way.